As you can see on your left, BottleSox and TubeSox do fit in bike water bottle cages. Welcome to NicheLab. We are the inventors of unique, common sense products that work. 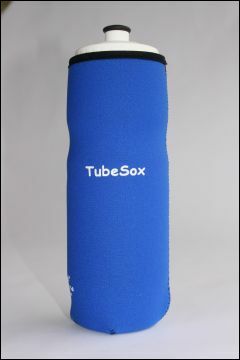 NicheLab's first two products were BottleSox and TubeSox.They were made to keep drinks cold in bike water bottles. But just as important, the BottleSox flap keeps the bottle valve clean from road gunk, bacteria in creek or road water and other junk that is thrown up by the rotation of your front tire. Peope saw how well they worked then asked us to make Sox to fit other needs such as small 12 oz. cans, long neck beer bottles, baby bottles, common 16.9 oz water bottles, larger water bottles, Gatorade bottles, Nalgene bottles and wine bottles. We have found many of these sizes also fit other things like Garmins,cell phones (great for keeping sweat off them while you run and/or bike), inhalers,and just about anything else you can think of. My personal favorite is folding the top down on a Reg/Short TubeSox and putting an ice tea glass in it. It makes the cold glass easier to hold, doesn't leave condensation on tables and keeps the tea colder for a longer time. I keep a few BottleSox in the fridge with a cold bottle of water in it so I can just grab it and go. In this Texas heat you have to keep hydrating. If you hydrate, you need BottleSox or TubeSox. 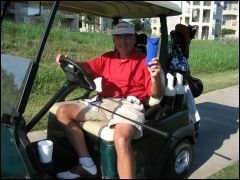 Other uses are hiking, backpacking, golfing, working out, driving, working and many other uses. 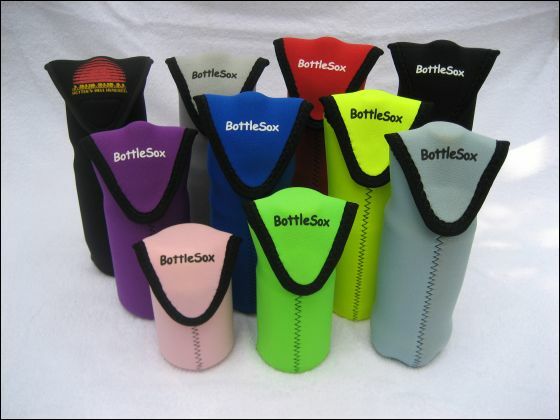 Plus, BottleSox keeps the sand out of your beer at the beach. We have also now made a holder for our Sox, called SoxCaddy. They come in 5 sizes and will hold everything from a 12 oz can to a 1.5 liter of wine or soda. They have a shoulder strap to carry the heavier containers. You can shorten the strap to have a wrist strap/lanyard for the smaller containers. We are adding them to our new website soon. We have also added a new pink for the ladies. Our soft pink was not what they wanted, so we now have a vibrant pink called Power Pink. It was a big hit at the Hotter'N Hell Hundred Expo. Coming to our website soon. 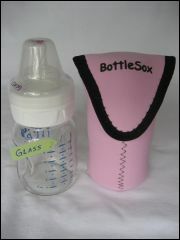 BottleSox is also great for baby bottles. We made them using a thicker 5mm neoprene for cushioning if you are using a glass baby bottle. Even if the bottle has an extra hard fall and breaks, the broken glass will be contained. Five sizes fit all standard baby bottles. They come in Soft Pink and True Blue. And if they get dirty, just toss into your washing machine. As some know, we have spent more time in inventing and perfecting than marketing. In fact, I have told everyone that we are going stealth until we have everything perfected. Our products are now perfect. Skinz Protective Gear in Minnesota has made the Sox better than I thought could be done. We are now putting the last touches on getting the right printing processes for personalization of our Sox. That should be done by August 2013. We are are also hiring someone to create a new website that has all our new products as well as personalization. 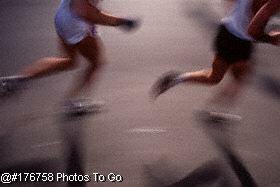 We are scheduled to have this done by November 2013. Browse through our site to see our unique products, and read our testimonials. And don't forget to check back with us...we have new products on the drawing board. BottleSox and TubeSox are designed to fit in most bike cages. Keep trail grit and bacteria off the bottle valve while biking with BottleSox. Keep your liquids cold while running. Use BottleSox and TubeSox while Hiking! !